ProHT Universal flexible projector/laptop trolley with two adjustable shelves, made to adjust according to your needs, used for Workstation, Presentation Cart, or Lecture Podium. 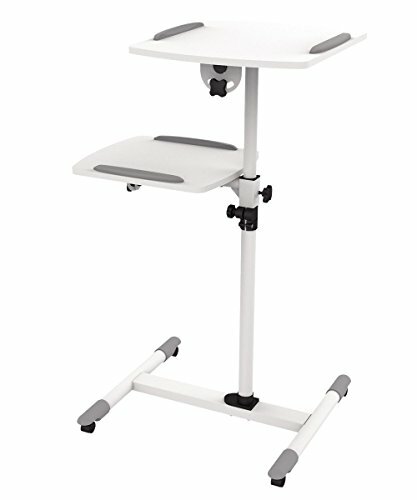 This multipurpose presentation cart is an economical choice for a variety of A/V presentation functions such as a lecture stand or laptop computer stand. Four 2" casters offer maximum stability (2 lockable). Stationary Wheel Locking Casters, Easily maneuverable on 4 casters. Raised edge stops keep your device from sliding off. Book stoppers on both ends of shelves. Freely height adjustable for different needs. Both shelves can be rotated 360° and tilted up to 35° (left of right). Easy access to assembly and disassembly. 100% quality guarantee. Universal flexible projector/laptop trolley with two adjustable shelves, Workstation, Presentation Cart, or Lecture Podium. Four 2" casters offer maximum stability (2 lockable). Stationary Wheel Locking Casters, Easily maneuverable on 4 casters. Raised edge stops keep your device from sliding off. Book stoppers on both ends of shelves.